There seem to be a million things I love about summer weekends at the lake: the warm breezes, dogs swimming off the dock, grandkids swimming, skiing and jumping from the top. We soak up sunrises and sunsets like they are the first we’ve ever seen. But then we begin to notice the leaves of the Yellow Poplar, “summer’s traitors” as we call them, turning golden long before we are ready to put away the floats and deck chairs. 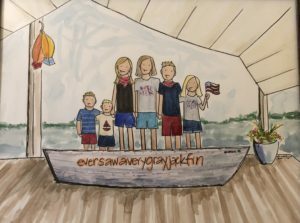 Every fall since 1986, when we built our lake cabin, we feel like Rat and Mole in the Wind and the Willow’s story Wayfarers All. As the story goes, “Nature’s Grand Hotel” is closing for the summer, and the vacationers are packing up and heading south for the winter. Rat and Mole attempt to coax them into staying a few more days or weeks or at least getting them to commit to visiting them in the winter. Every Fall I’m faced with a choice: I can either lament the end of Summer and stay grumpy until next May, or I can choose gratitude and hope in the next season. For me, I choose the latter and am thankful for SEC football season (War Eagle), picking the grandkids up from school, the Greensboro Symphony season, Triad Stage, the Bryan Series, Thanksgiving, and the Lighted Christmas Ball tradition of Sunset Hills to name a few. note three good things a week. Even the message at church yesterday was about gratitude and how it will morph into joy. Anecdotes aside, there is also a science behind gratitude. There are dozens of papers about the link between gratitude and health benefits from Harvard, UC Berkley, Indiana, and more. A recent article in Time Magazine outlined these possible benefits of practicing gratitude: more patience, improved relationships, heightened quality of self-care, better sleep, less overeating, fewer bouts of depression, and happiness that lasts. The other day I heard a fascinating story on NPR of Anup Patel, a neurologist in Columbus, Ohio, who worked with a group of children who had been granted a wish by the Make a Wish Foundation. The researchers discovered that the “wish kids” were 2.5 times less prone to need later hospitalization following their wish grant. Further, their overall medical costs including the cost of the wish (usually about $10,000) were significantly less than the non-wish kids. The joy from the wish grant was enough to give them hope and an opportunity to get away from their illness. And that, in turn, improved their chances of recovery. So how do we tap into this good news? Much of the scientific research can be boiled down to two actions: pay attention and write it down. When we pay attention to the good that is already around us and make a point of remembering it, the effect can be nothing short of life-changing. 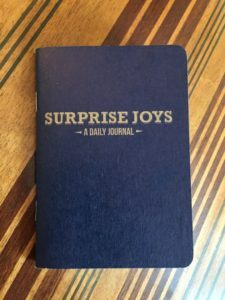 To help make that process easier, we printed up some pocket-sized journals dubbed Surprise Joys. Instead of a daunting blank page to fill, each day is limited to a single line of “joys” to remember. 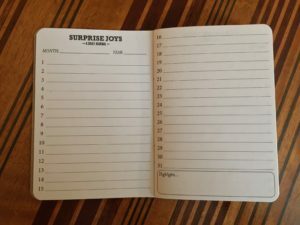 If you would like a Surprise Joy book (or 10! 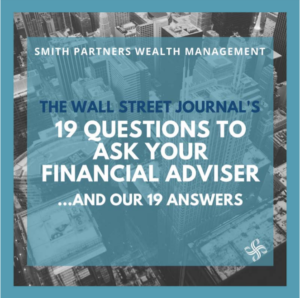 ), just let us know (team@smithpartnerswealth.com or 336-272-9488). We would love to send you one or several to share with friends or family.